American Board of Trial Advocates cy pres Award Presentation - Law Office of Scott Johni, P.A. 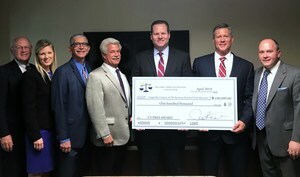 Scott Johni is honored, with the class represenative,Fred Williams, to present a cy pres award check to the Tampa Bay Chapter of the American Board of Trial Advocates (ABOTA) in the amount of $100,000.00. These funds come as a result of 12 years of litigation on behalf of 65,000 Florida consumers. There was a favorable class action verdict against a state-wide propane company that unlawfully charged propane tank rent to its customers. Under cy pres, the court approved a charitable donation out of unclaimed funds. ABOTA's primary purpose is the preservation of the civil jury trial, “Justice by the People”. They seek attorneys who display skill, civility and integrity, to help younger attorneys achieve a higher level of trial advocacy and to educate the public about the vital importance of the Seventh Amendment. The Tampa Bay Chapter of ABOTA wil use these funds toward promoting attorney professionalism. Pictured with the ABOTA representatives are Attorneys Kent Whittemore, Erin Lohmiller and Scott Johni.